Good Stuff NW: More Winter Markets! More Winter Markets! And then there were eight. 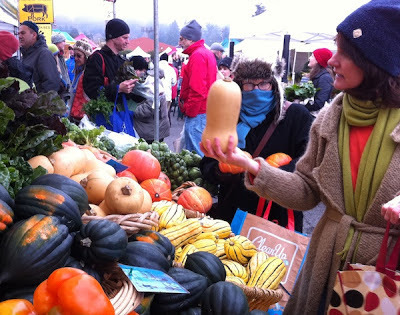 Winter farmers' markets, that is. As announced last fall, Beaverton Farmers' Market is opening for its very first winter season ever on Saturday, February 2, just in time for stocking up on healthy Super Bowl snacks. From then through April, on the first and third Saturdays of the month, it will feature a plethora of vendors bringing truckloads of winter greens, root vegetables, pasture-raised meat, warm wintertime soups and baked goods. "We'll open the market at 10 am rather than the usual 8 am opening time," said market manager Ginger Rapport. "So sleep in, have an extra cup of coffee, linger over the newspaper, then come see us." Vendors announced so far include market favorites Pepperheads, Lonely Lane Farms, Souper Naturals, Fressen Bakery and Feastworks. A new addition, Local Locovore, will feature organic baby food, and there will also be an Oregon Distillers booth where local spirits-makers will rotate their products throughout the season, with Big Bottom Whiskey and Eastside Distilling offered during the winter season. I hope to see you there on opening day! 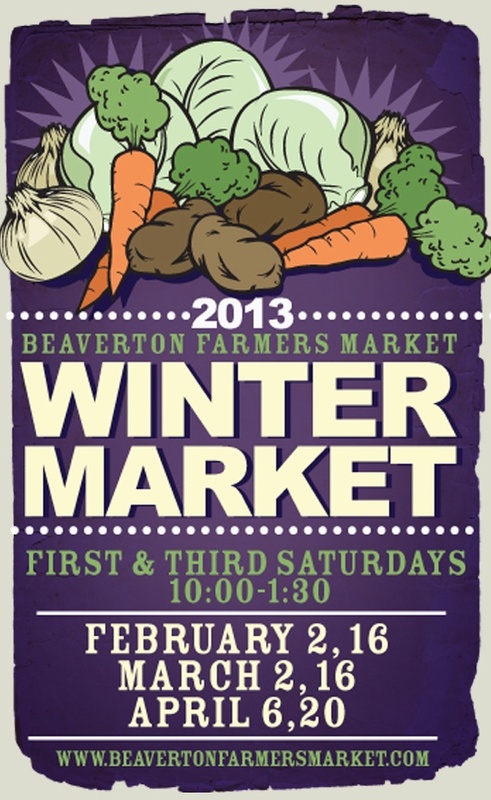 Details: Beaverton Farmers' Market, on SW Hall Blvd between 3rd and 5th Sts. adjacent to Beaverton City Park and the Beaverton Public Library. 503-643-5345.